Mommy's Free Reads: Remind Your Daughter She is a Princess! 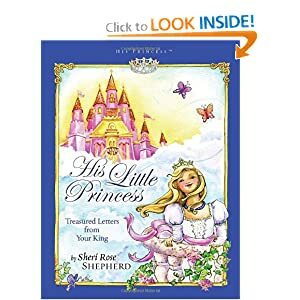 This book is a sweet reminder for any little girl about how much God loves them and how they can glorify Him in their personal relationship with their Father, the King. Each page has a little written to your little princess from God and a correlating prayer that the little girl can offer up to God. The letters are so sweet and well written. I will say though, that I was not thrilled about the illustrations or borders. I thought it dated the book quite a bit. Although my daughter is still a little young for this book (I would recommend ages 5-9), I can not wait to use it with her when she gets a little older. In a day when being a princess is the popular thing to dream of, you can make that a reality by reminding your sweet one that she is a daughter of true King.